Kashima (鹿嶋) is located in south-east of Ibaraki prefecture. It was developed for the welcome town of Kashima Shrine. Legend said, Kashima Shrine was built in 660 B.C.E. This area is very spiritual place in Japan, especially martial arts and battle because entire area is enshrined Kakemikazuchi, the god of war. So, many samurai and shogun had visited this shrine for the history of Japan. In 1489, Bokuden Tsukahara (塚原卜伝) who is the strongest samurai in the history was born. He was entitled “Kensehi” (剣聖, the god of sword), the highest rank of Samurai Master. Even famous Musashi Miyamoto wasn’t entitled as Kensei. Now, the spirits of his sword is still exist here, and many sword masters visit Kashima and his tumb. Kashima is also the city of industry. There are many industrial districts exist. Also, Because Kashima is located between Lake Kitaura and Kashima Beach, there are many fish market which offers great selection of fishes. At Kashima Beach, many people visit here and enjoy fishing and surfing. Around Kashima shrine, there are many restaurants which has very long history. Bokuden Tsukahara(1489~1571) is the strongest sword master in the history of Samurai. He was called “Kensei,” the god of sword. His father was served at Kashima Shrine and succeeded traditional Kashima style sword called “Kashima no Tachi.” Bokuden was born as the second son of him and trained his father’s sword at first. He was adapted by Yasumoto Tsukahara who is also the sword master of “Katori Shinto Ryu,(香取神道流).” He was also trained his sword by this father as well. When he 16 years old, he traveled for sword training and had a first sword fighting. In this travel which he spent 15 years, he had 19 sword fighting and joined 37 battles, and he was never injured through those fighting and battles except 6 minor injury by arrows. He defeated 212 samurai. In his second travel, Bokuden brought a couple of wood sword and taught his sword. After 10 years of this travel, his father died and went back Kashima. He becomes owner of Tsukahara Castle and ruled his land and trained his samurai. At the age of 70’s, he completed his sword style and named it “Ichi no Tachi (一乃太刀),” the sword of bringing the peace to the nation. In his last travel, he taught this “Ichi no Tachi” to many samurai including Shogun Ashikaga Yoshiteru. 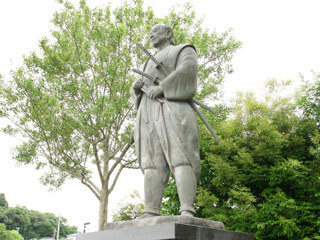 He visit Shingen Takeda and trained Shingen’s samurai, Kansuke Yamamoto, Haraminonokami, and Unnonotonokami. In 1566, his last travel was finished and he was back to Kashima. He deid in 1571. After his death, because his sword was so strong and spiritual to bring the peace, he was entitled “Kensei,” the god of sword. When he was sharing one boat, one samurai was talking to Bokuden about he is the strongest samurai. He said “You looks like good Samurai, what is your style.” Bokuden answered “I do Mutekatsuryu little.” Mutekatsuryu(無手勝流) means to win without fighting. When the samurai realized the meaning of Bokuden’s word, he asked him for sword fighting. Bokuden accepted his challenge and offer him fighting at the small island. When the samurai jumped out the boat, Bokuden start running the boat to escape. The samurai got so upset and yellowed him, but Bokude was cool and said “This is Mutekatsuryu. You got to cool down at that island.” The samurai realized how he was stupid and laughed himself with all due respects of Bokude.